Designed for the road and highway contacting, AP R asphalt plant is a continuous unit made up of 5 independent trailers, allowing to move or to change for adapting the asphalt unit to each specific market. The AP R is either stationary mobile or transferable version with an output slot from 100 to 400 T/h, it is designed to add up to 50% of recycled asphalt or to get in any another additive. The contra flow technology of the dryer  and the steel spreader blades arrangement inside the drum, allow an optimal thermal efficiency, resulting in a faster aggregates drying and blue fumes disappearance. Our patent system is located under the stainless wrapping to reduce the fuel consumption to 50% with 4 kg of fuel per ton for 6% of moisture, also reducing the CO2 emissions trough the chimney. The double shaft mixer allows a reduction of 1% of bitumen consumption and avoids the filler ball production. The design and the output of the AP R are such as filter size is less, compared to a traditional unit. That also makes it possible to store the filler before its injection towards the mixer. 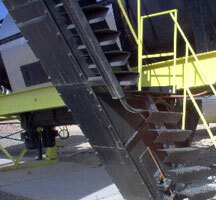 The drag slat elevator is interdependent of the storage bin , leading to a fast erection. Whole elevator is provided with dismountable wearing sheets from outside, avoiding the chain removing.